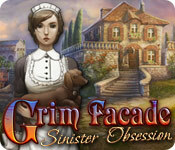 In Grim Facade: Sinister Obsession, you have been summoned to a lush vineyard by the maid of a wealthy family. When you arrive, the frightened girl hands you a mysterious diary that reveals the murders of three women -- but who is the murderer? Signs point to a member of the Conti family, yet Signor Conti and his sons are away As you delve deeper into your investigation, you realize that all is not as it seems on this rural Italian estate. Can you uncover the truth before you become the next page in the killer's diary?